We need umbrella to prevent shade outdoor in Summer, and it’s so nice that we can buy patio set with umbrella. But sometimes we just need a small personal spot in garden and backyard for reading and relaxing, enjoy the quiet moment by ourselves. And the giant umbrella shade is there without the possibility to move. 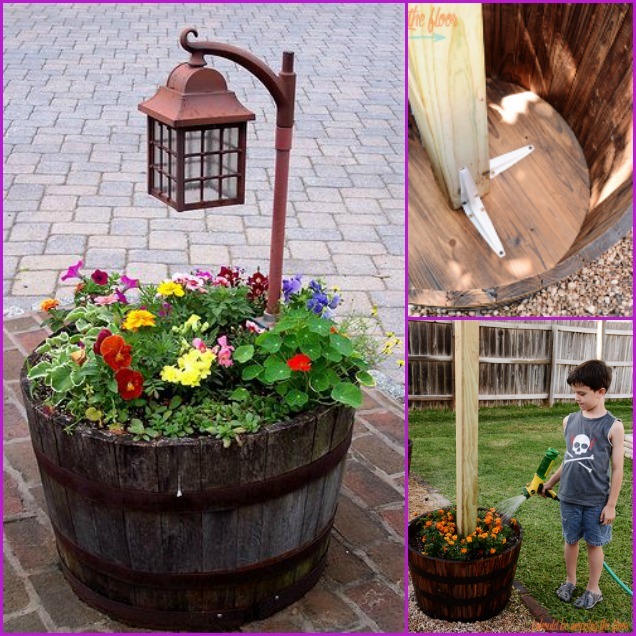 This umbrella and planter stand in one is a great idea for providing shade in outdoor area, and it’s quick, easy and fairly inexpensive to make by ourselves. Besides we can move it to any place you want. 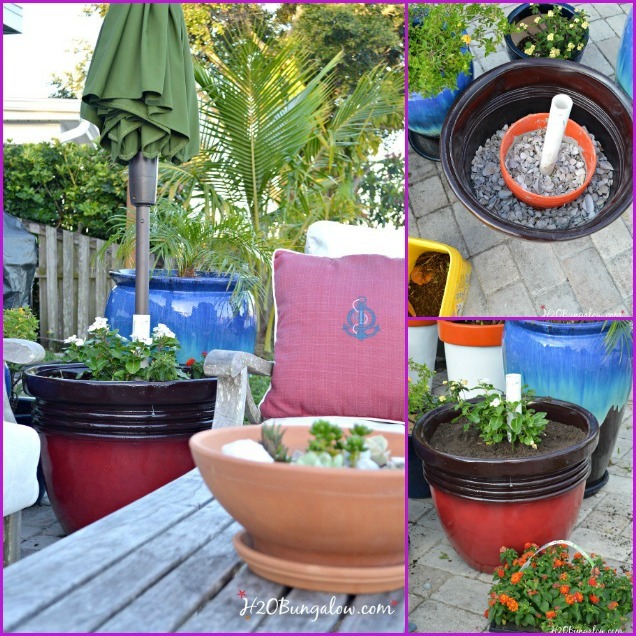 You can build the sturdy and pretty small patio umbrella planter stand with a container, PVC and concrete. This concrete will ensure you have a strong and stable umbrella base, while the container is perfect for any outdoor planting and flower gardening! You can use half of a wine barrel as you will see in the tutorial below, The green and flowers will not only look good, but give you fresh breath and good mood. You can also use a different container such as this terra cotta clay pot. Any container will do for as long as it’s large or deep enough to hold the umbrella securely in place and meet your personal favorites. And you don’t need to use it as umbrella stand only, you can make a lamp or a hanging basket with a pole instead as following. 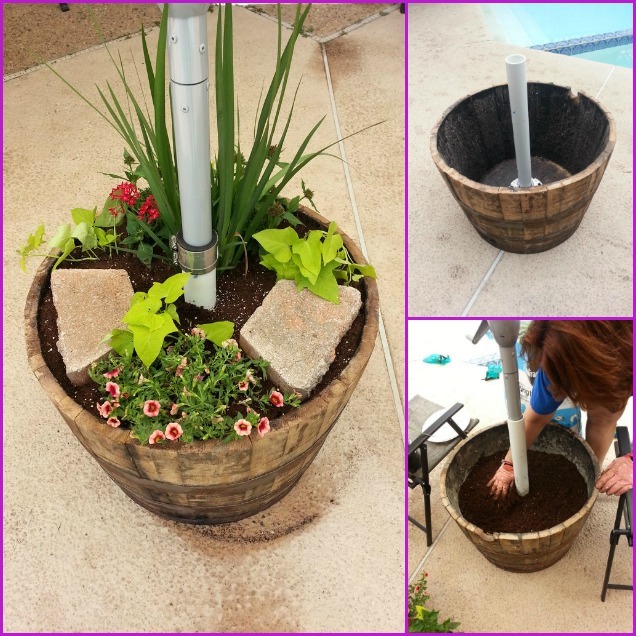 You can make a study planted post using a wine barrel and a wooden pole at its center. So beautiful to make and be used as outdoor lighting features at night.